There are 71 companies listed in our Animal Hospitals category for Orlando. This page shows listings 1 to 20. 24 hours on holidays, and weekends. 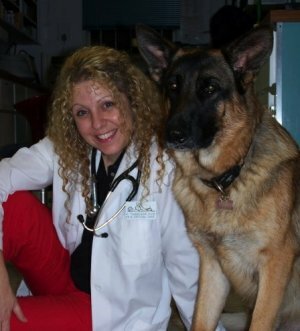 Dr. Tabbenor graduated from UCF and later earned her DVM from University of Florida College of Veterinary Medicine, classv of 1993. She has been working in emergency medicine since graduation. 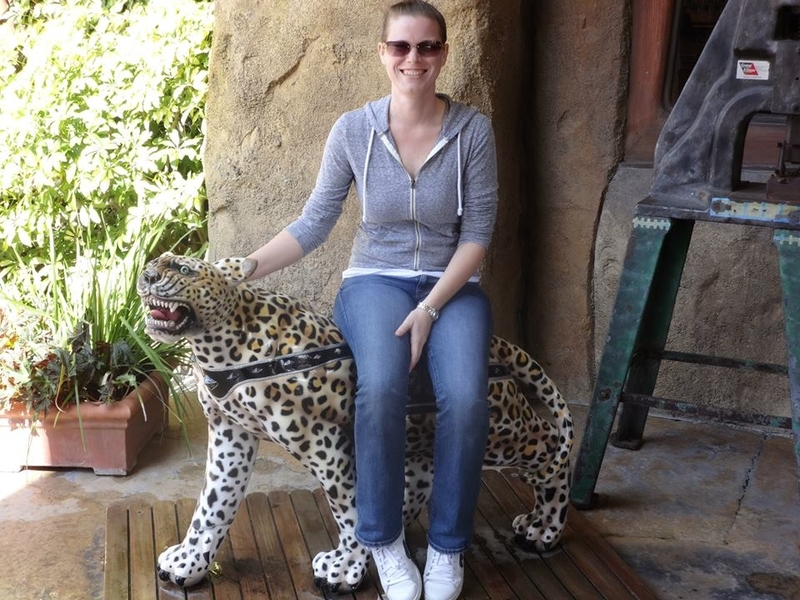 She also has been a member of the International Veterinary Emergency Critical Care Society since graduation. 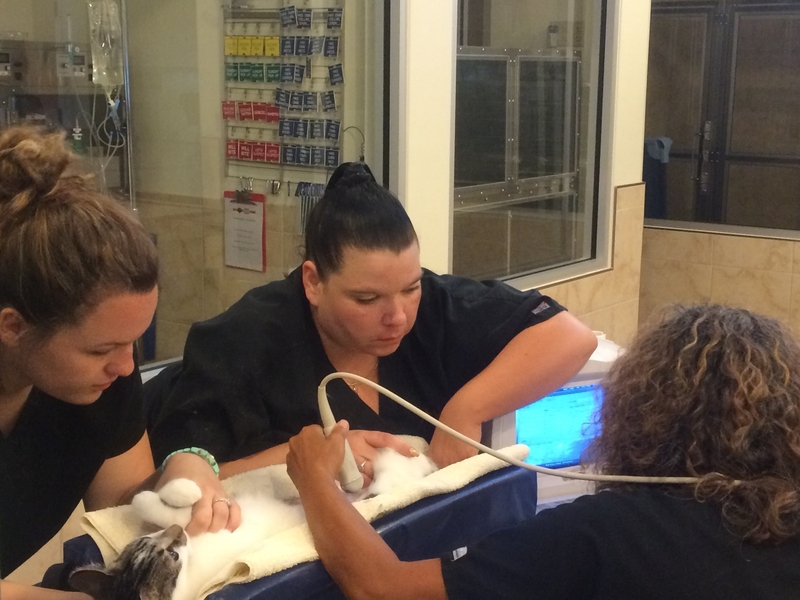 She opened the Animal Emergency Center in April 2006 to offer Central Florida residents a choice in emergency care. She enjoys seeing exotics pets including small birds and pocket pets. Her special interests are in diabetics, soft tissue surgery and GDV's. She has 4 beautiful daughters, and is the proud owner of a German Shepard Dog named Wotan, two unruly schnauzers- Sparky and Snowy, and Linus the cat. Dr. Wester joined our team as a full time associate in fall 2009. Originally from New York, he received his undergraduate degree from Fordham University in 1996. He went on the earn his DVM from Cornell University's College of Veterinary Medicine in 2002. He moved to Florida in 2006 and spent his time working in a small animal day practice before joining Animal Emergency Center. He has particular interests in emergency medicine, dentistry and acupuncture. 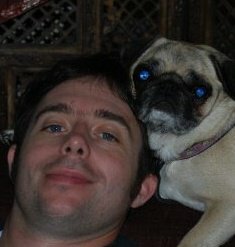 He is the proud owner of Ping Ping the pug, Casper the chug, and Violet the cat. Hi, I'm Ariana, and I was born and raised in Boston, MA. I moved to Orlando in 1999. 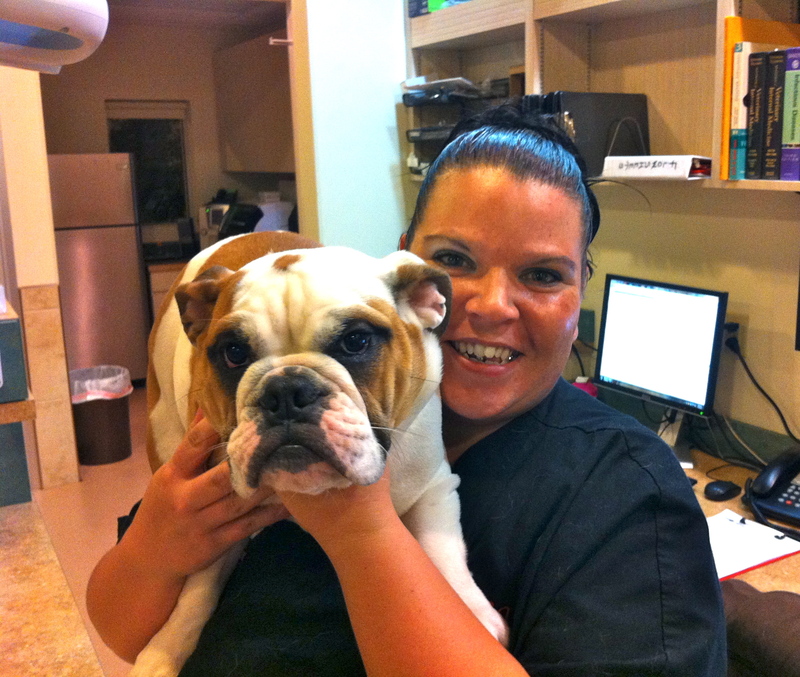 I graduated from Florida Institute of Animal Arts as a veterinary technician in 2003. 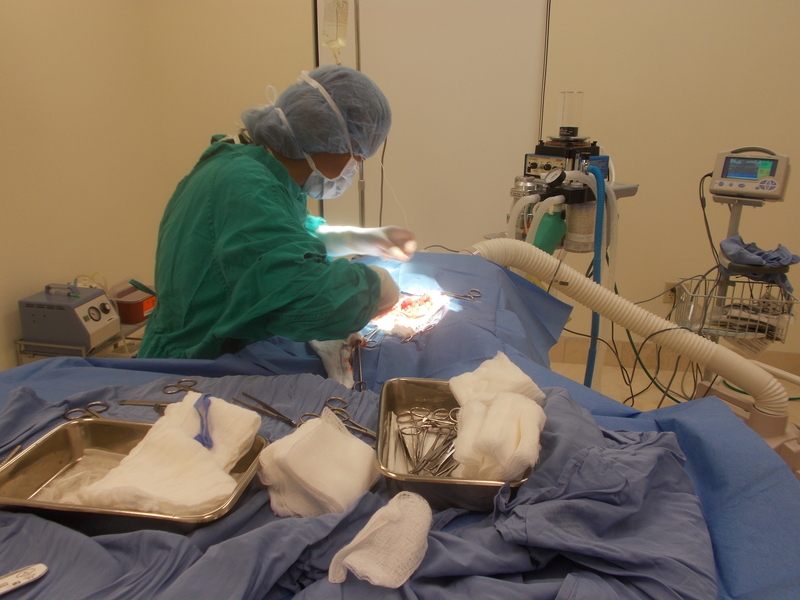 I worked at a daytime veterinary hospital for 3 years before I started my adventures in The Animal Emergency Center in December 2009. I have always wanted to work with animals and have a particular interest in emergency medicine. I have 3 cats: Baby is a 14 year old persian, Reggae and Cheetohs are both 2 year old domestic short haired cats. I also have a crazy 1 1/2 year old blue pit bull named Na'Ji. 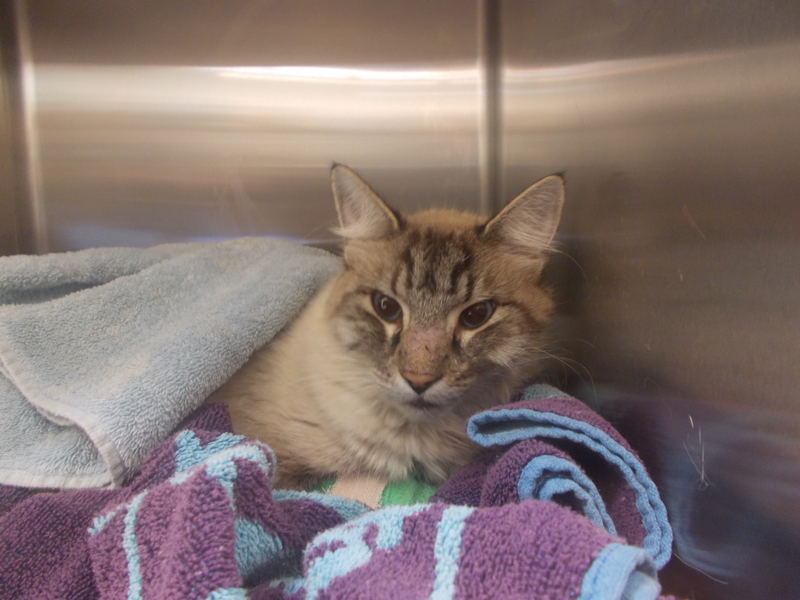 My name is Justin, and I've been part of the Animal Emergency Center for over two years. I have had the pleasure of working with animals for almost my whole life. I am originally from the the Appalachian Mountains of Tennessee. I started working with horses at an elementary age, and as I grew older I invested my time in the development of raising chickens. This was a community project with a local 4-H Club that I was a member of. We would raise them to adulthood, and auction off the chickens for charity money for the club. I had usually grown so attached to the animals that I had my mother set up someone at the auction that would buy them and give them back to me. I couldn't handle the thought of giving them away since I had raised them since before they had feathers. Time went on and I was later interested in shelter medicine. 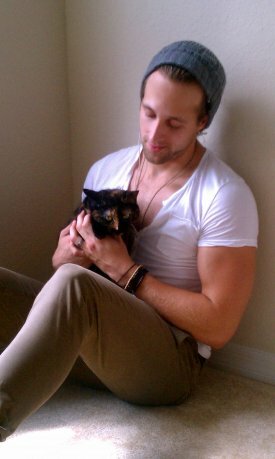 I worked with the Humane Society of the Tennessee Valley for about a year. I have a huge passion for shelter medicine because its where I learned I had a talent with animals. I expanded my knowledge after working with Humane Society in Tennessee by working with a private practice for about a year before I moved to Florida. 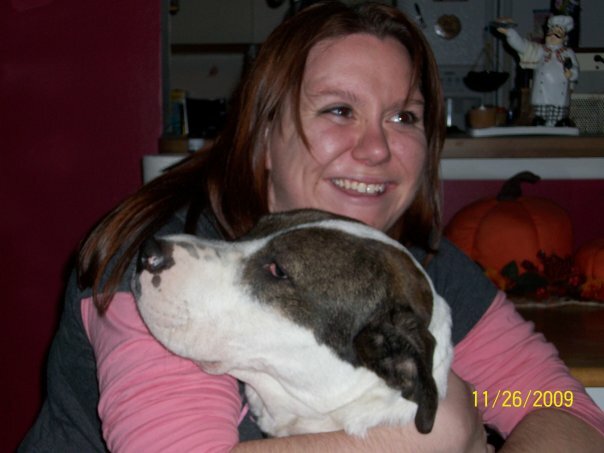 I moved to Jacksonville, FL and worked with the Jacksonville Humane Society for about 2 years. This was an amazing experience for me because we did a lot for the community. I became a certified member of the medical team D.A.R.T. (Disaster Animal Response Team) of the Humane Society of the United States. I was part of the Katrina relief, where 50 or so dogs were transported out of the devastated area and into a safe environment. 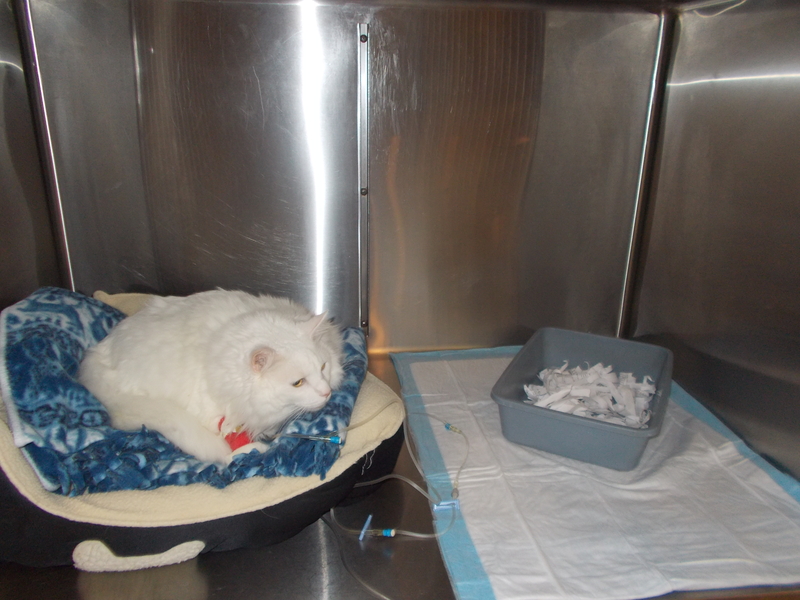 We helped medically assess each pet, and treat accordingly. Some the pets were even re-united with their families. 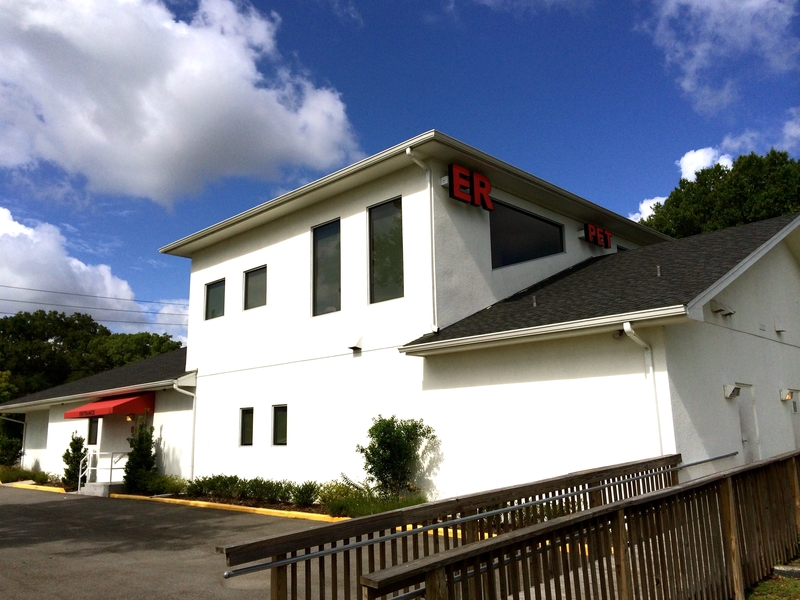 I eventually grew more interested in emergency situations, and that lead me to an Animal ER in Jacksonville where I was a nurse for three years. This was great experience because I was trained to work in intense situations. I continued my education going to lectures at Universities and conferences around the United States. 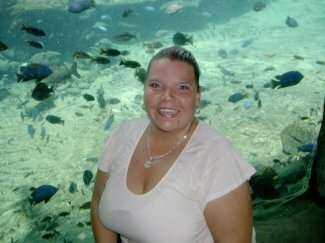 I moved to Orlando in 2009, and started working for the Animal Emergency Center. I love my job and I enjoy being there for you and your loved one in a time of need. Hello, my Name is Sara. I moved to Florida from New York around 4 years ago. 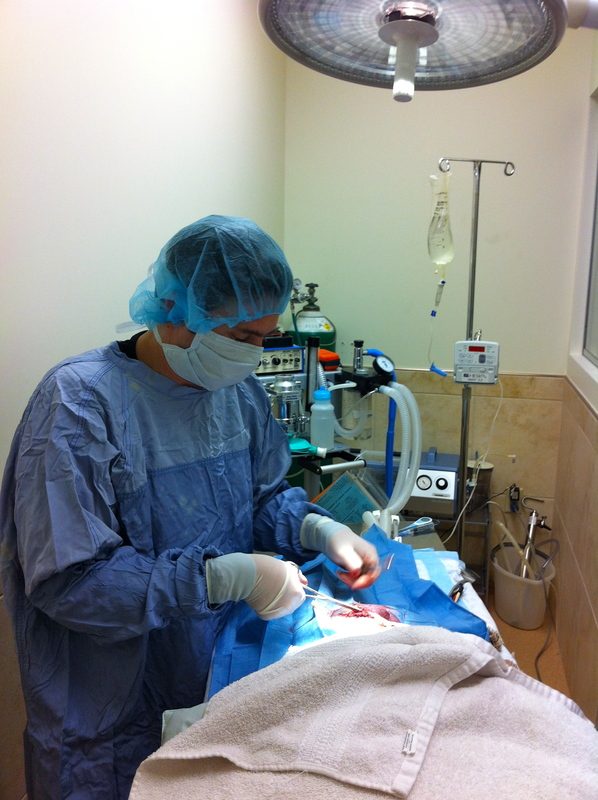 I have always had a passion for Veterinary Medicine since I was around 5 years old. My house has always been filled with presence of animals. 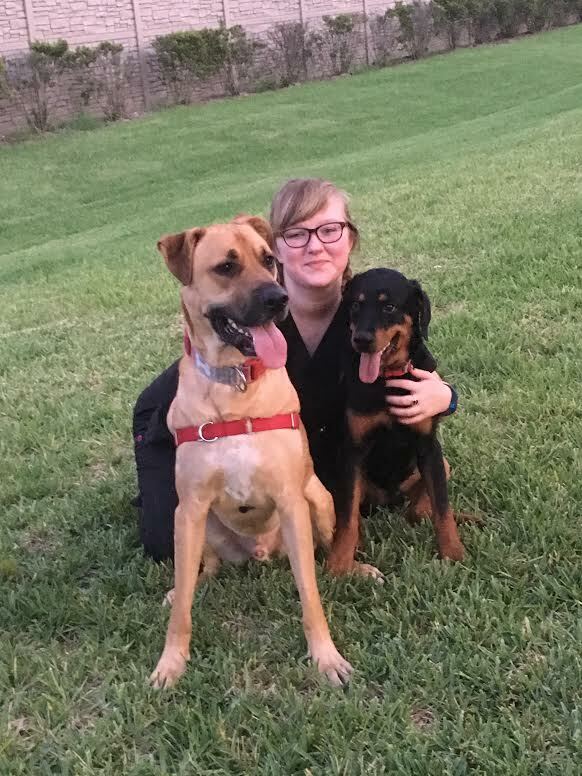 Currently I, myself, own two dogs, a German shepherd mix and a Rottweiler. My parents own our other four animals; a golden doodle, puggle, yorkie, and a domestic shorthair cat. I am currently pursuing my Biomedical Sciences degree for pre-veterinary studies, and hope to soon attend the University of Florida for my Veterinary degree. I began working for the Animal Emergency Center June of 2016 as a Patient Care Nurse. I couldn’t have found a better experience than this! My name is Nicole and I am one of the overnight veterinary nurses at this fine establishment! I started my career in the animal healthcare/welfare fields back in 2003 as an animal care specialist at a local humane society in Englewood, Florida. Then a year later I got hired at a small animal practice as a veterinary technician and that is what I have been doing ever since. I did work at the SPCA of Central Florida in Sanford (now Pet Alliance of Greater Orlando) as an Assistant Shelter Manager for a couple of years in 2007, but realized that I missed being a veterinary technician and went back to working in day practice. I can’t imagine doing anything else with my life! 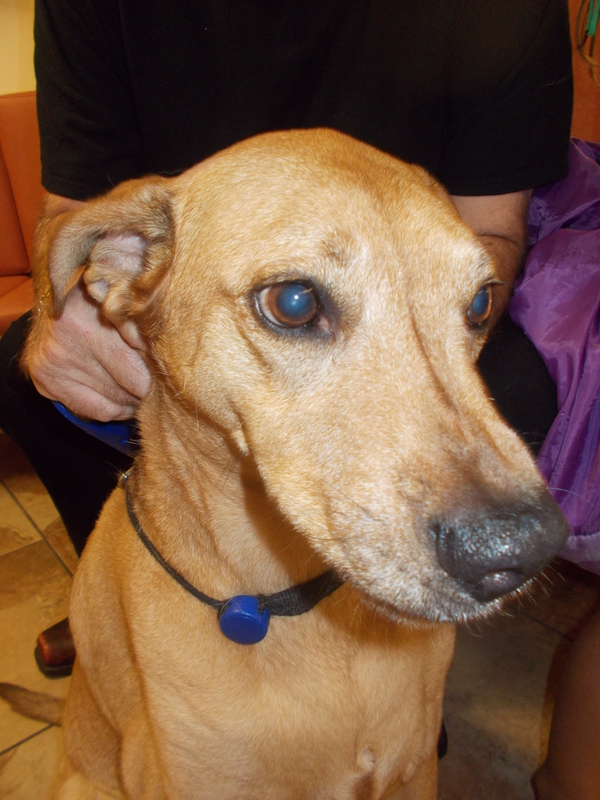 I love helping animals in need and I love when I can give back a healthy pet to a happy owner! This is my second time working at the Animal Emergency Center and I can honestly say that I enjoy coming to work every day and being the best vet tech that I can be. I thrive on the hustle and bustle of working in emergency medicine and I welcome the challenges that I face every day at work! I have worked at many day practices over the years, but nothing compares to working in emergency medicine. When I’m not working, I’m usually watching movies, screaming my head off on a rollercoaster at a theme park or watching the Washington Redskins play. I enjoy spending time with my fiancée of 15 years and my cat, Pipple. My name is Heather and I am originally from Pennsylvania, but spent most of my life here in Florida. My parents are big animal lovers and they have passed that down to me. We grew up having a menagerie of animals – dogs, cats, mice/rats, turtles, a chinchilla, a rabbit, and you can’t leave out the rotating fish! I currently have a spoiled Old English sheepdog (Riley), a mischievous Manx cat (Henry), and, the resident old man, Red-eared Slider turtle (Oscar). Animals have always been an area that I greatly cared about but it wasn’t until 2007 when I got my first job at a veterinary clinic that I truly found my passion in veterinary medicine. I am currently enrolled in the Veterinary Technology Program at St. Petersburg College. It is through this program I will be getting my nursing, certification and Bachelors in Veterinary Technology. 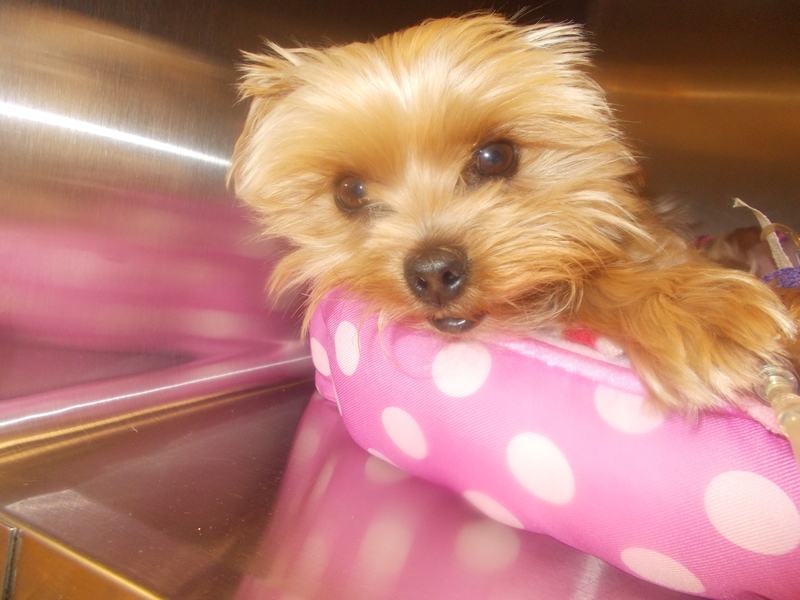 Since 2007 I have worked as a receptionist, a kennel technician, an assistant, and most recently a veterinary nurse. During this time I have worked in day practice as well as a couple years in emergency medicine. While I do like the client/patient bond that day practice brings, it is emergency medicine that brings unpredictability to the every day. I enjoy creating that bond with the client and their pet, to make every situation as comforting as possible - even in an emergency. I joined the Animal Emergency Center team in October of 2016, and I could not have found a more impressive group of people to help me be there for you and your pet. Minor cuts to major exploratory surgeries are available. IV and inhalant anesthesia is available and intubation is available to all patients. 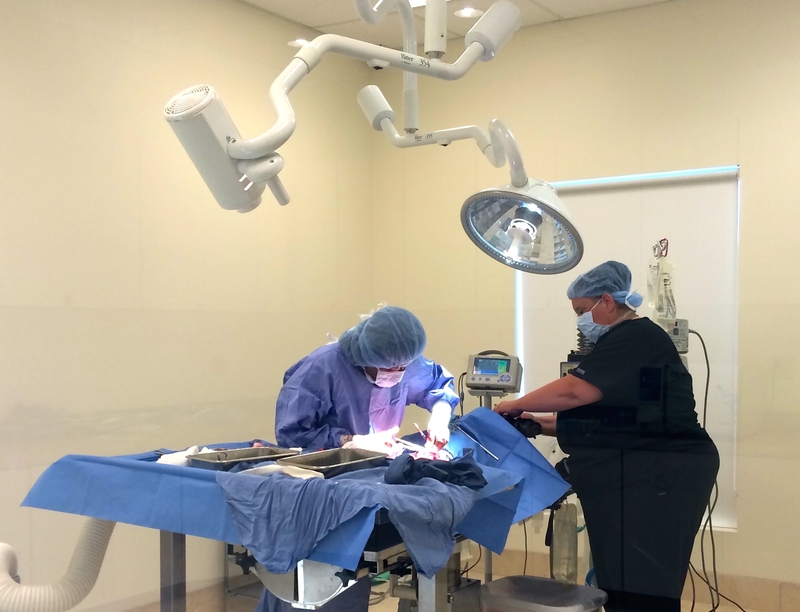 All patients are heavily monitored by our experienced staff while in surgery. 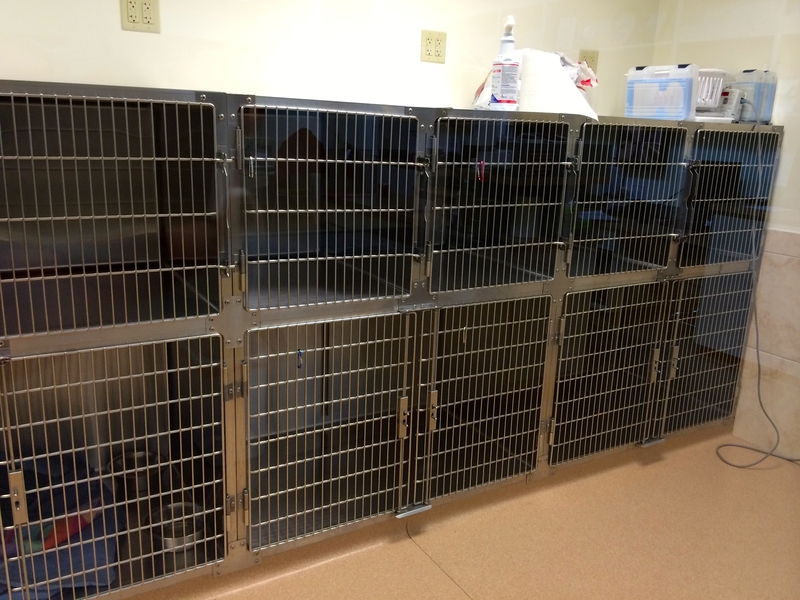 The Animal Emergency Center's cages have additional heating support built in for patients that are hypothermic. 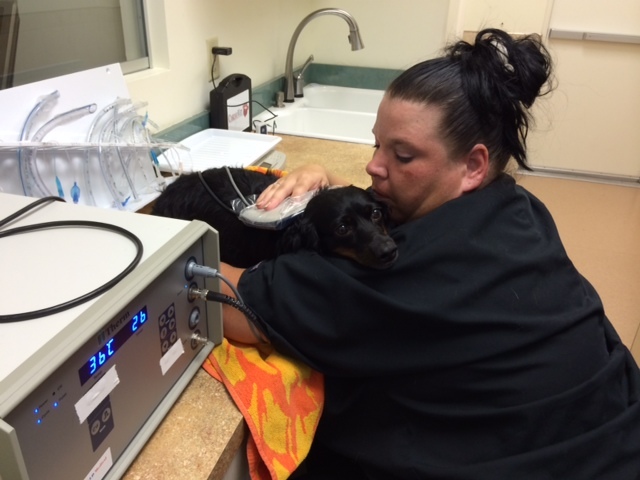 The Animal Emergency Center uses a bair hugger to help any hypothermic patients to climb back up to a regulated temperature. 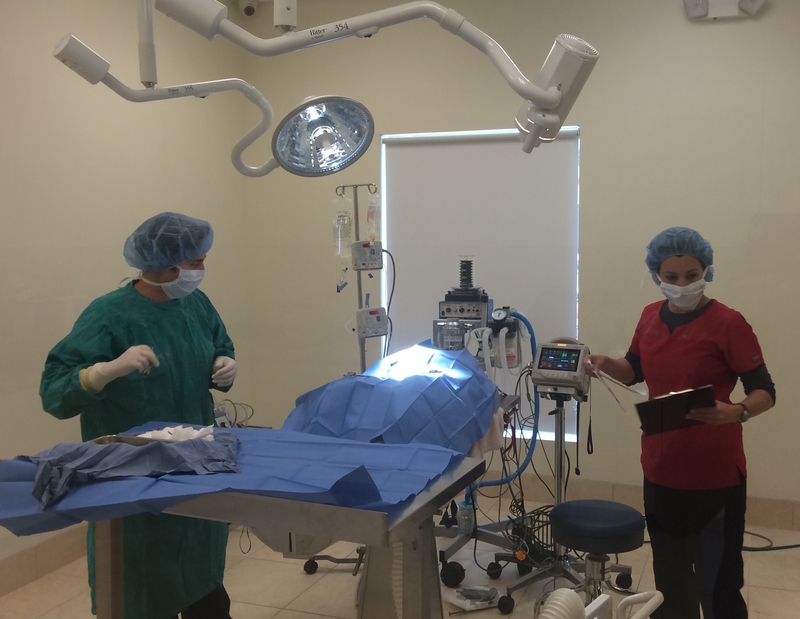 At the Animal Emergency Center all patients are monitored by our nursing staff and doctors overnight and over the weekends. We have incorporated into our practice the ability to take one of the highest quality digital radiographs in Central Florida. 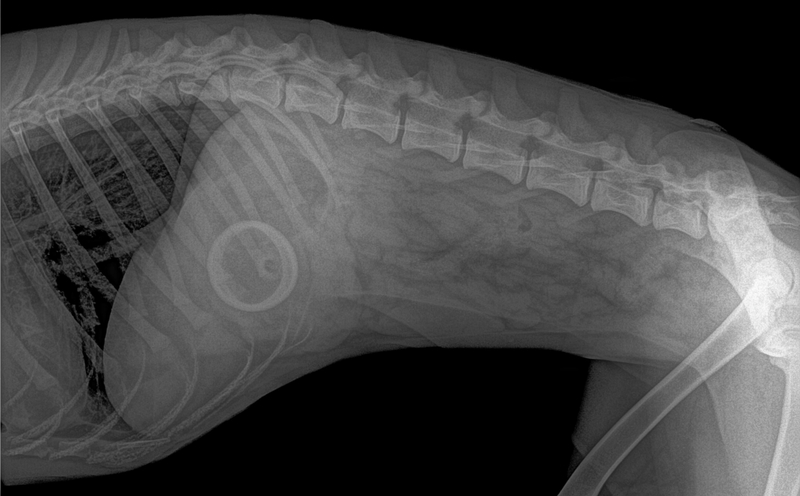 Each radiograph takes 2-4 seconds to process and copies of these radiographs are sent home with the owner on CD for the primary care veterinarian. 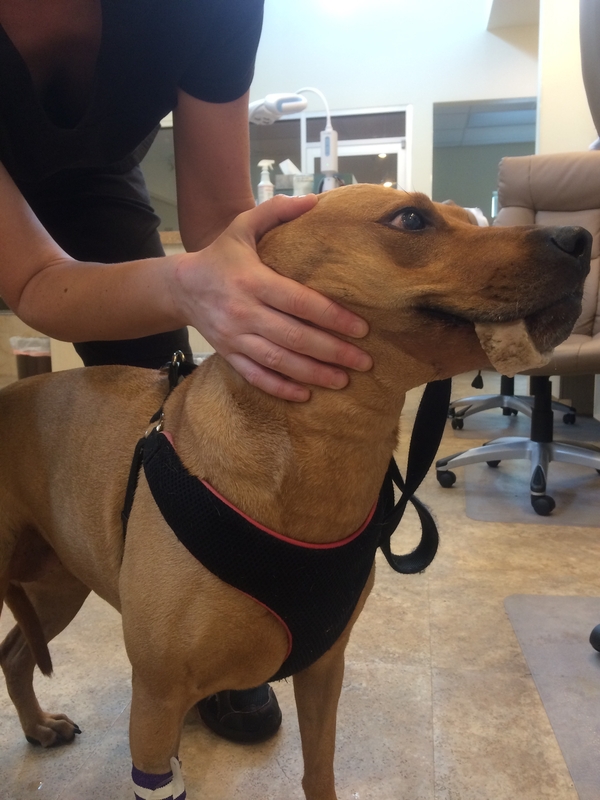 All of our radiographs are also sent to be read by a board-certified veterinary radiologist to ensure that your pet gets the highest level of care possible. Foreign bodies in the stomach or esophagus can often be removed without the need for invasive surgery. 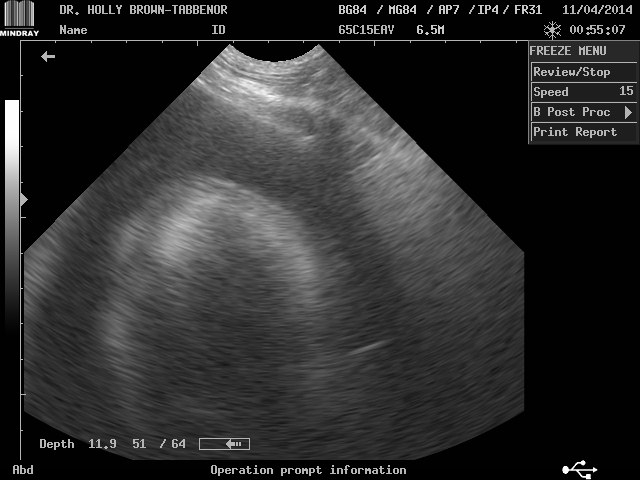 Guiding for cystocentesis or scanning the abdomen or thorax. Pregnancy checks available. 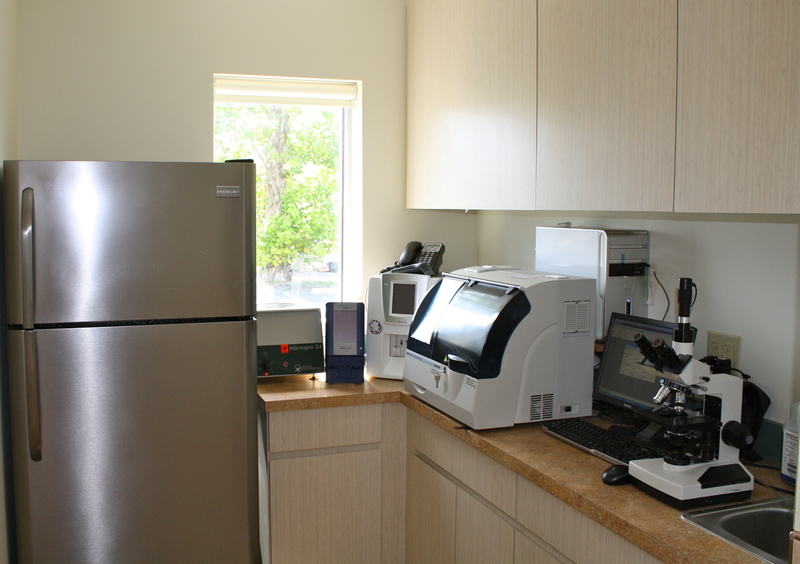 The Animal Emergency Center is able to offer complete in house blood work diagnostics. 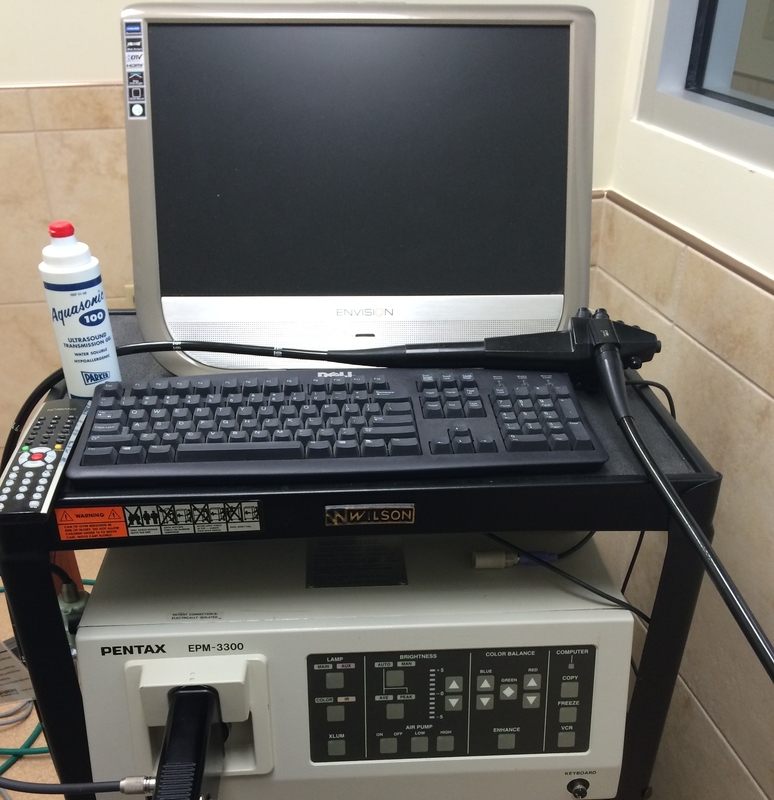 This includes Complete Blood Count, Electrolytes, Chemistries, and Blood Gases. All of our blood work is done in-house, and results are within a few minutes. 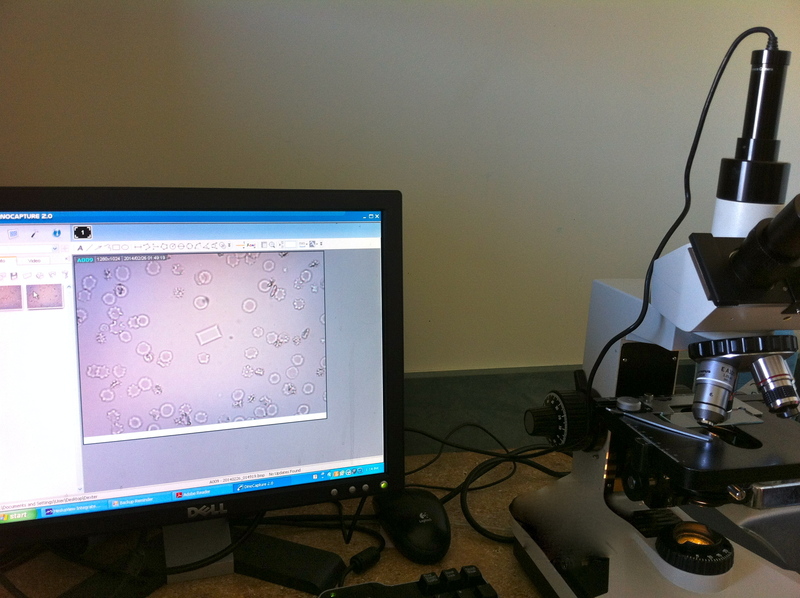 The Animal Emergency Center is able to do Cytologies and document findings with the latest in digital microscope technology. 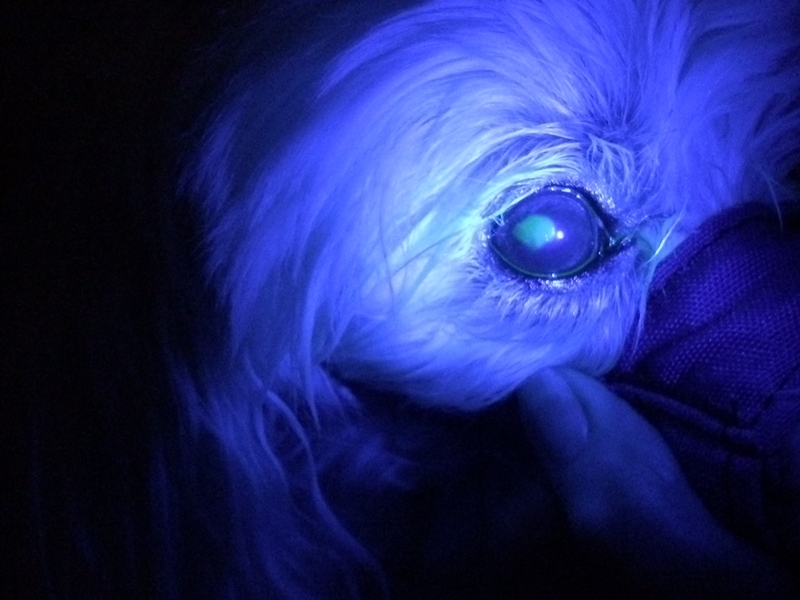 This give our clients a chance to see what we see, and better understand the findings from their pet. A non-invasive revolutionary system for fast and effective healing in rehabilitation and pain management. This treatment increases blood flow to the affected area. This will allow for increased nutrients and oxygen to reach this site and the removal of debris and excess fluid. By removing inflammatory mediators, excess fluids and debris from the affected area, analgesia (pain RELIEF) is produced. I-therm is non-invasive and will safely heat the affected area allowing for faster healing. I-therm can be used for acute or chronic muscle injury, neurologic pain or tendon injury. Presently I-therm treatments are being used to treat hip dysplasia, oseoarthritis, joint pain, inflammation, open wounds, herniated discs, open wounds and many internal medicine pathologies. 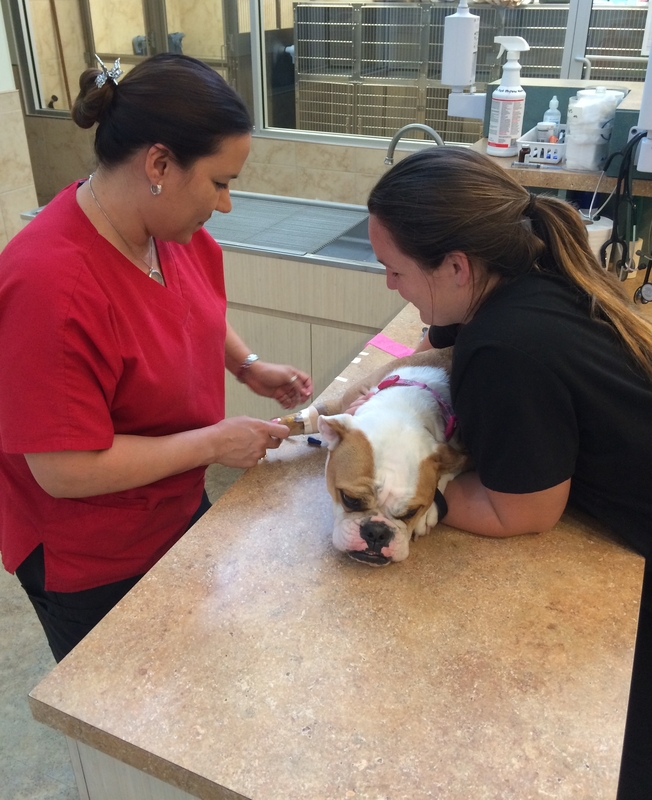 Over 80% of the treated pets are pain free or experience significant pain reduction. I-therm can be used WITH all other treatments with no contraindications. Possible side effects of the itherm treatment may be fatigue, lasting about 8 hours, or a mild tingling sensation in the area treated. Mobile lift table for transportation of a patient. East Bound on SR408: Goldenrod Exit, turn right onto Goldenrod at the end of the exit ramp and then take the next right onto Underhill. We are the second driveway on the right hand side. West Bound on SR408: Goldenrod exit, turn left on Goldenrod at the end of the exit ramp. Then drive under the overpass to the 2nd light which is Lake Underhill. Turn right we are the second driveway on the right hand side. I-4: Exit for the SR408 Eastbound. Take the Goldenrod Exit, turn right onto Goldenrod at the end of the exit ramp and then take the next right onto Underhill. We are the second driveway on the right hand side. 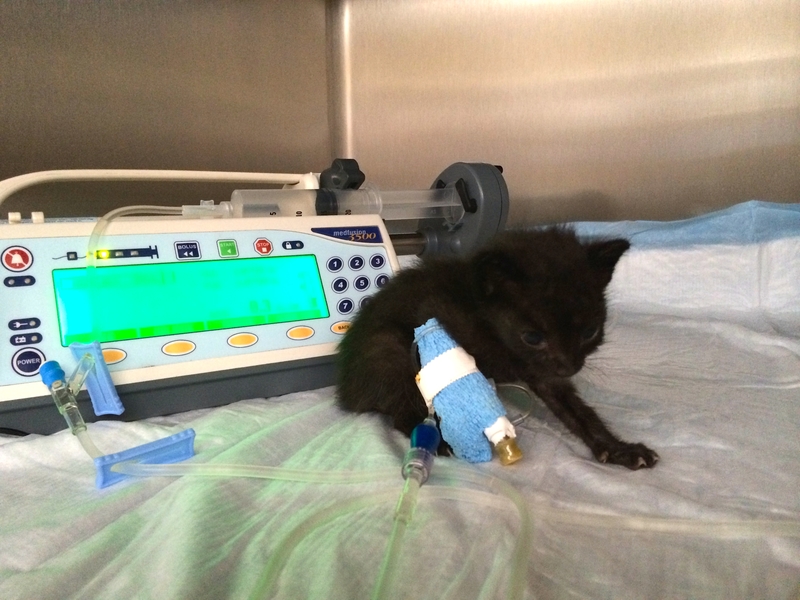 At the Animal Emergency Center we pride ourselves on patient care. That is why we have patient care nurses who take on all of our hospitalized patients needs. 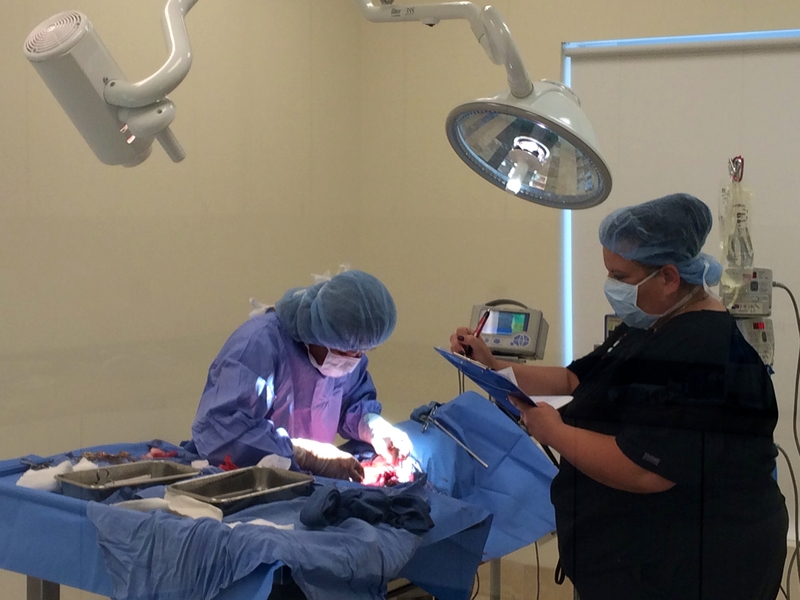 At the Animal Emergency Center we do a wide range of surgeries. At the Animal Emergency Center we see a lot of lacerations. 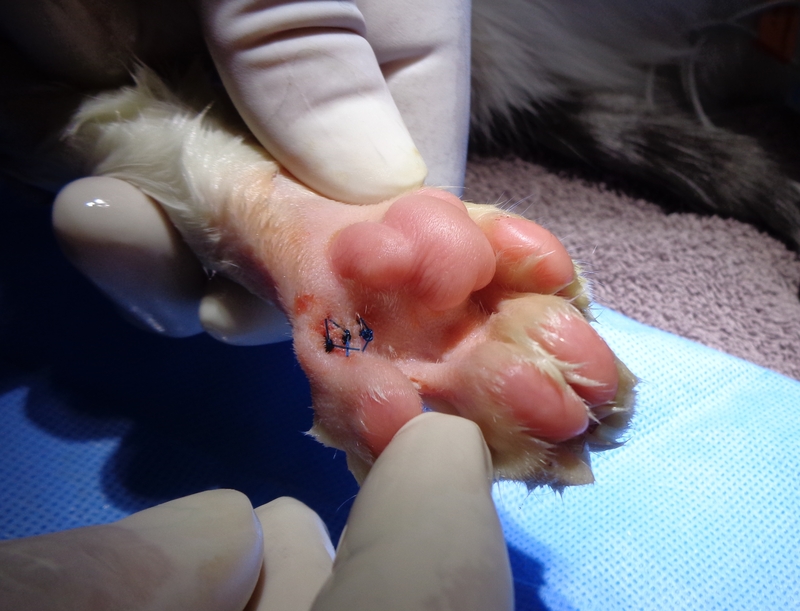 Some lacerations are from fights with other animals or pets just stepping on something. However, big or small, the Animal Emergency Center is here to help you and your furry loved one in the time of need. We are located at the North West corner of Lake Underhill and Goldenrod. Our address is 7313 Lake Underhill Road, Orlando, Fl 32822. 8219 S. John Young Pkwy.